Here's Wedgewood with the Z axis components (minus the actual coupling for the X axis) in place and supporting the aluminium T-section that will serve as the X axis slide. Tests conducted by twiddling the vertical shafts by hand suggest that there is no need for guide rails on the Z axis, so that simplifies construction a bit. Also, note that I've trapped the nuts for the Z axis between slabs of MDF. Another quick construction technique. 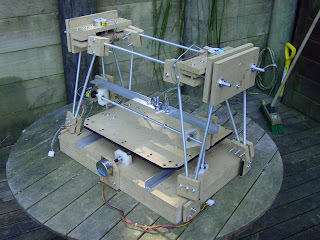 So far, all of the bits can either be reprapped or made from MDF and epoxy or CAPA. Wow that's really coming along! I'll have my version build up a bit better hopefully by Wednesday and I'll dump it on the Makers Blog if I can. She's a babe! Nice one Vik. So good to see the principle proving. We need to talk on carriage designs. There's a whole design philosophy on that can of worms. Can't wait to see these things moving!! !